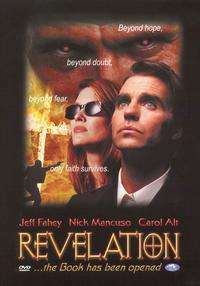 Apocalypse II: Revelation is a 1999 Christian/thriller and sequel to Apocalypse by Cloud Ten Pictures. Three months have passed since the events of the previous film. Franco Macalousso (Nick Mancuso) has convinced many of those left behind that he is the true Messiah. But is he? Counter-terrorism expert Thorold Stone (Jeff Fahey) tries to put the pieces of his life together. His wife and daughter were among the millions who vanished in the Rapture. In the course of his investigation of an underground resistance movement, he uncovers a conspiracy that leads to the heart of the new world order. Stone throws in his lot with this group of rebel Christians, which includes journalist Helen Hannah played by actress Leigh Lewis, a computer engineer working for One Nation Earth (Tony Nappo), and a beautiful blind cynic (Carol Alt). The "Haters" find themselves in a race against time as the World Government distributes Virtual Reality headsets to every single person on Earth, to be activated on the Messiah's "Day of Wonders". The film begins with Thorold Stone, a counterterrorist agent, watching home video tapes of his wife and daughter, both of whom have vanished in the Rapture. The next morning, Stone and his partner, David Nidd, track down and arrest a mysterious terrorist group known as The Haters. Stone orders that the group be taken to the nearest headquarters of O.N.E. - One Nation Earth, the world government opposed by The Haters. While being carted away, a woman named Selma Davis confronts Stone and slips him a disc she claims will reveal the truth about his wife's disappearance. As they leave the hideout, Stone and Nidd notice a disturbance in a nearby building. When they check it out, they are confronted by Len Parker, the manager of WNN (World News Network). Parker punishes the agents for disobeying orders by shooting them both, and leaves them for dead - displaying supernatural powers when he walks through the wall; yet, Stone mysteriously wakes up to find he is still alive. In another cell of the Christian Underground, Helen Hannah informs her group that their initial plan with the disc has failed, and O.N.E's exact goals remain obscure. A member named Cindy worries that the public will fail to rise up against O.N.E, since crowds cheered the execution of Hannah's boyfriend, Bronson Pearl, on national television (This is possibly a continuity gaffe, since no such event is shown in the first film). The group is also mystified by a pair of Virtual Reality headsets they have received by mail. Meanwhile, at the O.N.E. Headquarters, various alleged Haters are being thrown into cells, half of which were denounced by their own families and sent for reeducation. Parker's agents inform him that Stone is alive and in possession of the disc. Furious, Parker orders a complete manhunt for Stone. He then vents his feelings by torturing Selma Davis. Stone, on the run, turns to his friend Willie Spino (a computer expert) for help. He is able to persuade Spino that O.N.E. is not the benign organization it is widely believed to be, and that the so-called Haters know valuable information. Spino manages to hack into O.N.E. 's security system, but this alerts O.N.E. to their location. Desperate, Spino suggests they flee to his stepsister's house; said stepsister in question is revealed to be Helen Hannah, and her house is also her cell's hideout. Spino discovers that the disc contains a powerful computer virus. The group quickly realize its use - O.N.E. has been sending VR headsets to everybody on Earth, to be activated on the upcoming 'Day of Wonders' but Stone is skeptical about the Christian Underground - he confronts Hannah about God's cruelty in taking millions hostage; however, the former acknowledges O.N.E. as the greater evil and agrees to help upload the virus. Spino is able to sneak Stone into Headquarters by passing him off as a guard. At midnight, the Day of Wonders begins. Cindy, tempted by curiosity, tries on the headset - and encounters Franco Macalousso, the Leader of O.N.E in person who presents himself as the Messiah, freeing Cindy from her blindness. Fooled, Cindy accepts the Mark of the Beast. She then persuades Spino, with whom she has begun a relationship, to take the Mark. Possessed, Spino and Cindy attempt to kill Hannah, who manages to flee. Hannah then infiltrates the Headquarters with the help of a secret ally - Ron Spalding, a converted guard. Stone tries on the headset, so that the virus may enter O.N.E's virtual reality. Encountering Macalousso, Stone is almost fooled when he sees illusions of his wife and daughter. He suddenly has an epiphany and realises that Macalousso is the Antichrist. Furious at being rejected, Macalousso prepares to decapitate Stone on a guillotine - but Hannah and Spalding disable the computer running the headset just in time. Parker, Spino, and Cindy arrive with a group of agents. Parker takes Helen, Spalding and Stone into a room where they join Davis, her daughter, and a young boy. Parker gives the Christians one last chance to renounce God, but meets refusal. As Parker leaves the room, Stone tells Selma that he's sorry and she forgives him. They all start to sing "Amazing Grace". Outside, the agents pull down a switch, revealing the room to be a giant furnace; yet, Parker is startled when they don't burn - God is protecting them. Parker decides to go into the furnace and kill them himself but when he opens the door, the fire immolates him and invades the entire building. The O.N.E. Headquarters burn down due to the rampaging furnace, killing many people, including Cindy - but leaving the Christians unharmed. The O.N.E. is temporarily weakened by the sabotage of Virtual Reality and the destruction of their Headquarters. An angered Macalousso swears to continue the fight: "They will not prevail against us!" The film ends with Stone looking at a picture of his family. He knows they are safe.